By Georgianne NienaberHollywood and hip hop have joined forces in a final push to save the Lakota sacred religious site Pe'Sla from the auction block. 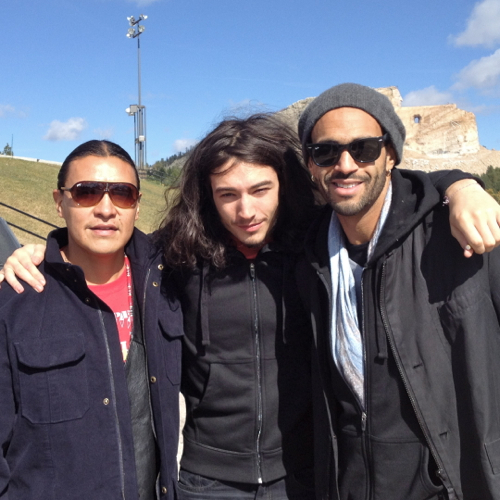 Ezra Miller, now starring in The Perks of Being a Wallflower, and producer Sol Guy went to South Dakota to meet with Standing Rock tribal member Chase Iron Eyes in early October. The result is a nine-minute documentary that is featured on the Pe'Sla fundraising site, hosted by Last Real Indians. Fundraising has come a long way since August, when 1,942.66 acres of privately-held land containing sacred sites was offered for sale in South Dakota. Still, a final deadline of Nov. 30 looms, and the tribes face a $2 million shortfall. Pe'Sla, located in the Black Hills of South Dakota, is the epicenter of the creation story of the Lakota, Dakota and Nakota nations. Tribal elders and spiritual leaders conduct ceremonies essential to their culture and beliefs there. The story to save Pe'Sla is a narrative of people coming together to support an idea that the sacred is essential. Private donations raised $388,000 and the Sioux Nation united to contribute $6 million, putting the public auction on hold. People offered pennies to hundreds of dollars as the struggle to protect the holy from development touched hearts around the world. At approximately three minutes into Sol Guy's documentary, Chase Iron Eyes, founder of Last Real Indians, passionately explains what he calls the "powerful narrative" of Pe'Sla. For the first time since the Battle of the Little Big Horn, the great Sioux Nations "have come together." The lesson of Pe'Sla is that there is power in unity and it is time to stop writing about native people as helpless and hopeless. This show of solidarity between the Sioux Nation and people around the word is a vindication of the sacred; a testimony to the tenacity of indigenous people as they struggle to survive in the face of seemingly impossible obstacles. By Kristi EatonMore celebrities are backing an online campaign to raise money so that Native American tribes in South Dakota can purchase land they consider sacred. P Diddy and Bette Midler are the latest big names to throw their support behind a fundraising effort to buy nearly 2,000 acres of pristine prairie grass in the Black Hills of South Dakota. Three days after the campaign began, P Diddy tweeted: "Help save the Sioux Nation! Click here," and linked to the website. Midler also lent her voice, tweeting: "Incredible story re the Sioux Sacred Grounds. Donate what you can." More than $18,000 had been raised as of Sunday afternoon—$6,000 flowed in immediately after P Diddy's tweet. The campaign will last through Nov. 30, when the tribes of the Great Sioux Nation must have $9 million in order to purchase the land.Comment: For more on Pe' Sla, see Sioux Need $9 Million for Pe' Sla and Rosebud Signs Deal for Pe' Sla.